This is the third post in my series on my road trip through the American Southwest! You can also read about my 24 hours in Zion National Park, or the areas I explored in Page, Arizona on this trip. This was the day with the most driving in my trip. Originally when I planned to do the first part solo I planned to drive from Page around the Grand Canyon to the trailhead, but since I brought my friend along I needed to get her back to the airport in Las Vegas. I also picked up two members of my Havasupai crew at the Las Vegas airport so we could all save on rental car costs. We took our time waking up and getting ready and then my friend drove us from Kanab to Vegas while I napped in the passenger seat. Since we were the only registered drivers on the car I would be in charge of the 4 hour drive from Las Vegas to the trailhead. I needed all the rest I could get before taking that on! So much driving on this day! I dropped off Rachel and picked up my Havasupai crew from the airport. Around 3:30pm we all piled into the rental car and started the four hour drive to the trailhead. 60 miles of this driving is on Indian road 18. I had read many reports to be aware of the wildlife if driving down that road in the dark, but I still wasn't prepared for how bad it would be. Someone in the car was JUST asking me if I had insured the rental when we rounded a corner and almost plowed into a longhorn bull and his female friends. We also saw three giant elk that were bigger than our rental SUV standing in or near the road. 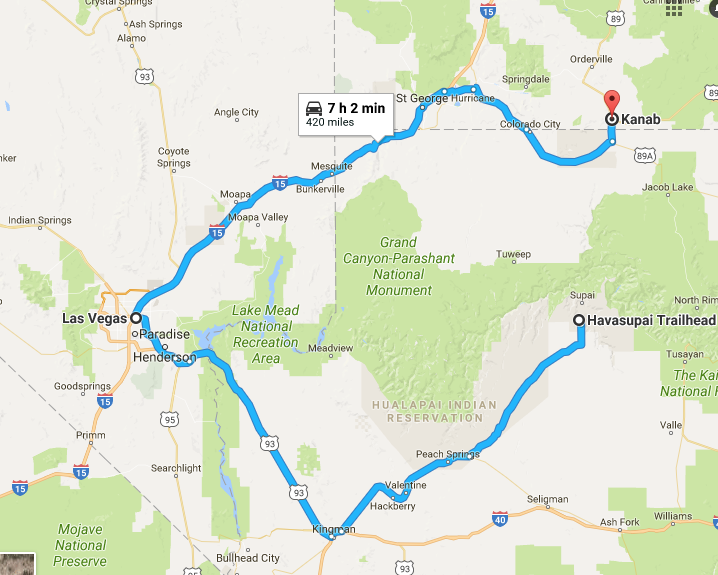 I white knuckled it and drove between 30-40 mph in the middle of the road the rest of the way to Hualapai Hilltop (the trailhead for Havasupai). We arrived at the trailhead and there were a lot of cars and people there. Don't expect to get the best sleep if you stay at the trailhead! We piled all of our packs on the floor and drivers seat while two of us slept in the back of the SUV and one slept in the reclined passenger seat. It was cramped and awful for all of us, and to make matters worse around 1am a super noisy group finished their hike back and shouted at each other while drinking beer in the parking lot. Please don't be those people in the middle of the night! There are a ton of other people sleeping in their cars preparing for a 4am start! I would also recommend ear plugs if you are a light sleeper. Even if people aren't shouting over beers people will be arriving and leaving throughout the night so it's not a quiet place to sleep. I wanted to start hiking around 4:30am but the rest of my group wasn't feeling that so we started at 5:30am just as the sun was starting to rise. The hike down was generally easier than I expected, but my backpack camera attachment was making one of my straps dig into my shoulder. At times my shoulder muscle would seize up from the pain and I would rest my pack against the canyon wall trying to get some relief. 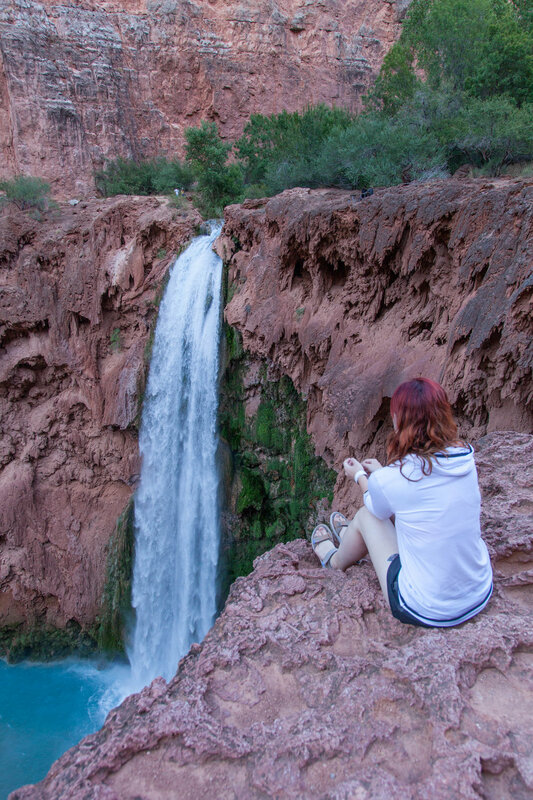 I was so happy when we finally got to the village of Supai to check in, but the town is still a mile or so from Havasu Falls and the campground. That last mile was the most brutal as the sun had come over the canyon wall and was blaring down on us. 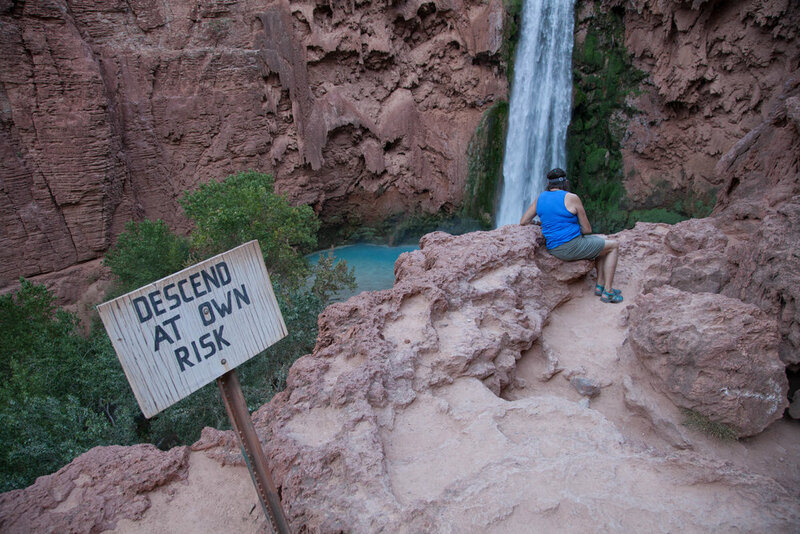 We took photos above Havasu Falls and made our way to the campground to find a site. We passed the spring and there was a site right next to it that some people in our group were considering taking, but it was also in the middle of the trail and I thought that might get noisy and annoying as people walked through our camp to get water. Another girl and I kept walking through the campground for a little while and found a perfect secluded site by the canyon wall. The previous occupants had even left their food hanging rope so we didn't need to put up a new one. We set up camp and made lunch before heading down to the falls. I set up my camera and tripod and took some photos before rejoining my group with our floaties in a little pool downstream. We all drifted in and out of sleep while we bobbed in the water. Nothing felt more perfect after our terrible night of sleep and early morning of hiking. After getting out of the water we checked to see if the fry bread stand by Havasu Falls was open, but it wasn't, and unfortunately it never opened during our time in Havasupai. We walked back to camp and passed out for a couple of hours. 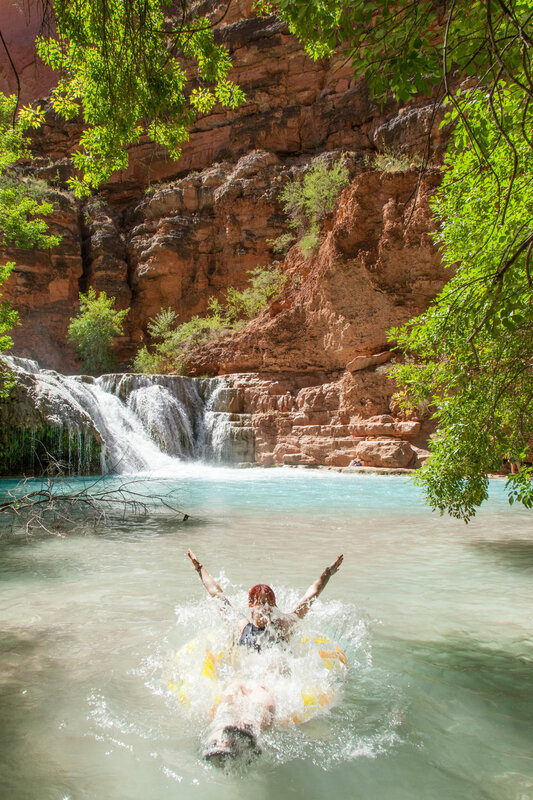 After waking up we explored the campground a little more and scoped out the trek down to Mooney falls that we planned to do in the morning. I went into a snack fever before we ate dinner. The hunger was so real. I thought I may have packed too many snacks for a two night trip, but I am glad I packed as much as I did! I ended our trip with only two Rice Krispy treats leftover. We played Cards Against Humanity under the stars for a while, but we all ended up passing out at 8pm. The breeze rustled through my rainfly and I woke up a few times thinking dogs or squirrels were trying to get into my tent, but otherwise I had a great night of sleep and it was a perfect day in Havasupai. This little cave is so pretty before it gets sketchy getting down to the base of the falls. I woke up with the sun and made coffee since everyone in my camp was still asleep. Slowly everyone woke up and we made breakfast before heading out to Beaver falls. We had scoped out Mooney the night before so we knew what we were getting into with the slippery ladders going down. I expected to be terrified, but after doing Angels Landing in a thunderstorm earlier on this trip I actually felt completely fine on the ladders! We took a couple of photos but quickly got on the trail to Beaver since I had heard that Beaver falls loses light around 2pm. As far as we went on this trip. You can also hike to the confluence with the Colorado river but we didn't have time for that! The trail required a few river crossings so I wore my shoes I had dubbed my, "mom sandals" and they were the perfect choice! I was able to quickly wade across the river whenever we needed to cross while everyone else in my group needed to take their boots off and on again. One girl accidentally fell in the water when she tried to cross the river on logs/rocks and realized too late they weren't stable. Moral of the story: bring water shoes or sandals you would also feel comfortable hiking a few miles in! They are worth their weight in gold if you make the trek to Beaver! At least some of the crossings had bridges! There were a few ladders down to Beaver falls as well, but nothing as steep or slippery as the ladders at Mooney. When we made it down I found a secluded little area to take photos, and ruined my camera remote in the process...oops! Then we waded a little further downstream to a secluded pool and floated/napped there. After our fingers got pruney from the water we dried off and headed to a picnic table we spotted above Beaver to eat lunch. It was 1pm around then and the sun had already slipped to the other side of the canyon, leaving Beaver Falls without direct sunlight. You definitely want to head there early if you want to see the falls lit up by the sun! Shortly after this my camera remote stopped working....shocking right? The hike back to camp was fairly uneventful other than me abandoning my group to run back to try to see Mooney lit up by the sun. Spoiler alert, I didn't make it in time. I did however find a little rope swing on the opposite side of the falls from the trail. When my group caught up we all took turns swinging off of it into a semi-deep pool below. Once you get out of the water...it's cold and misty from the falls. We quickly dried off, put our boots back on, and waited in line to head back up the steep scary ladders. They aren't as scary on the way up! I really didn't want to leave this spot! Once we got back to camp we checked one last time to see if the fry bread place across from Havasu Falls was open and it wasn't :( so much sadness. When we got back to our campsite one of the girls in my group discovered squirrels had gotten into her tent and eaten all of her snacks out of her backpack. The squirrels also gnawed through the rope hanging one of our stuff sacks of food and trash and we found it on the ground. They didn't get through the stuff sack thankfully, but the chubby little squirrels at the campground are no joke. Double bag and hang your food and trash! Do not leave it in your tent! After refilling water and making dinner we started packing up what we could since we needed to get an early start on the trail in the morning. Right outside the village of Supai on our hike out. We woke up at 4am and finished packing up before beginning our hike out at 5am. I really tried to push myself up the final mile to the parking lot. A group of hikers who had mules carry their packs even cheered for me as I passed them! I ended up finishing at 9am and the rest of my group all trickled in by 9:30. Plenty of time to drive back to Vegas and one girl even switched her flight that evening to earlier so she could get more rest before returning to work the next day. I am so glad I made this trip and am so thankful to know people that were just as pumped as I was to go. Our group is already planning our next big backpacking adventure together and I am super excited!